Homemade BBQ Sweet Potato Chips. Today I’m solving all problems with chips. Don’t they say that foods that crunch relieve stress? I don’t know who “they” are and unfortunately they probably suggest eating a carrot to solve the issue, but I vote chips. All day, every day. 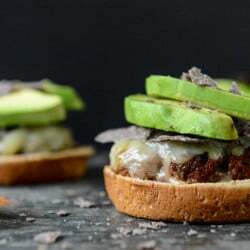 Lately I’ve run across the predicament of developing recipes that solely revolve around tex-mex situations or burgers or sandwiches. I’m sure you’ve noticed. Just when I think I’ve got a handle on it, I deal with that full force and combine the two. I sit down and make these giant lists of recipes to make for my invisible internet friends and then instead decide that weirdly flavored enchiladas are appropriate or that I can attempt to turn anything – I mean, anything – into a taco and margarita fest. Today I’m just giving you something you can eat with your burgers. Or with your beer. Or your hot dogs! Or with your emotions. You know. Whatever works. Oh… and if we’re being reeeeeal honest… something to put on top of your burgers. Or inside your sandwiches. You know it’s the best. I’ve never been a giant chip eater unless salt ‘n vinegar or bbq kettle cooked chips were staring me in the face. Sometimes I love the crunch for a sandwich-type lunch but for once in my lifetime, one of those itty bitty single sized, fairly appropriate portioned bags often does the trick. The only place I really get wacky about chips is Target because they have omgthebestflavorsever and I just cannot get enough. I usually end up buying three or four bags and opening them all at once and having a chip tasting party in my car. So trashy. And the only time I get wacky about chips in restaurants is when they are freshly homemade and served with blue cheese. Like, lots of blue cheese. Ugh. Love that. The deal? 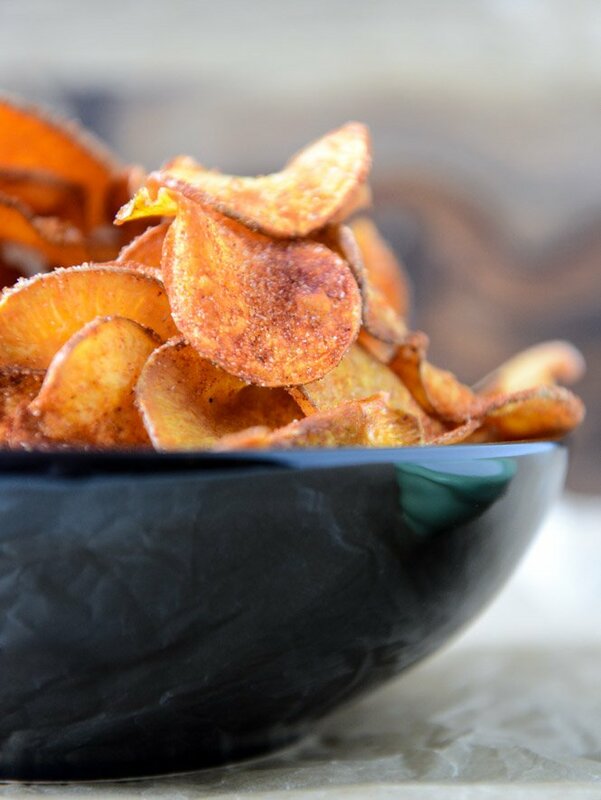 Homemade potato chips are sort of high maintenance, especially of the sweet potato variety. They just take a while. In hindsight, they are still easy to make – you simply have to be willing to stand in front of a hot pot of oil for a long while, tossing and turning and draining and seasoning. It is 100% COMPLETELY WORTH IT. Say it with me. Worth it. Maybe not worth it for a giant group of people, like a gigantic gaggle of adolescent males who will eat you out of house and home. But for one person, like maybe a husband that does the same? Or a small group? These are so fun and delicious. Or just for yourself. You deserve it. This little seasoning mix I throw on top of the chips is my go-to “bbq flavor” that I’ve perfected to our liking since first making my crockpot bbq beer chicken. I encourage you to play around with it a little if you like – use regular paprika if you don’t want smoky or add a little extra cayenne for some kick – whatever you want. This is a spice rub that I use multiple times per week in our house and I have no qualms in saying that it has taken me a year to feel like I realllllly got it right. And we are talking about me: Miss No Patience. Anyhoo, go getcha some chips this weekend. Make ’em! You will not regret it. Even when you eat them all in on sitting… you will not regret it. Add about 4 inches of canola oil to a large pot and heat over medium high heat, fitting the pot with a candy thermometer. You want the oil to be at 350 degrees F, so if it continues to rise, turn down the heat a bit underneath. Cover a large cutting board with paper towels. In a bowl, combine paprika, onion powder, brown sugar, garlic salt, chili powder, salt and pepper. Scrub sweet potatoes and pat dry with paper towels. Slice as thin as possible using a mandolin or a very sharp knife. Add chips in batches to the hot oil, frying for 4-5 minutes at a time, using a large slotted spoon to turn the chips over while frying. 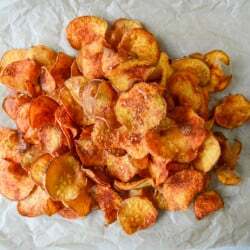 Once chips are golden and crispy, remove with a large slotted spoon (or a kitchen spider) and place chips on the paper towels to drain. After about 30 seconds, sprinkle with the homemade bbq seasoning and toss well to coat. Let cool completely. Make sure chips aren’t piled on top of each other so they can cool and crisp up. Serve immediately! Um and oh – you should probably dip them in this. Stuff You Should Probably Definitely Make For SUMMER. Yep, super amazing! I could eat a ton of these! OH THE CHIPS! 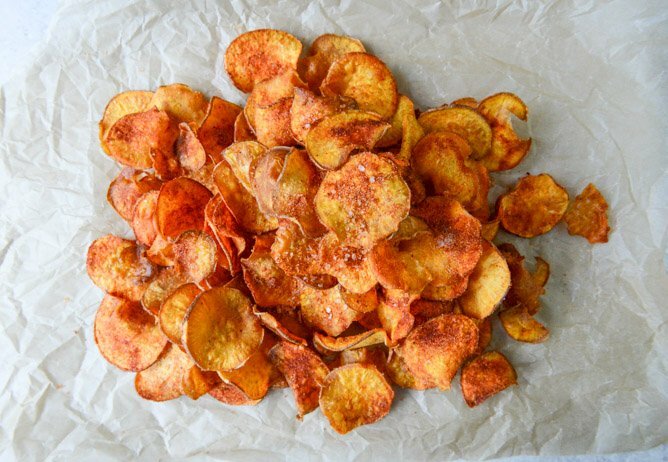 These sound freaking amazing, dare I say I even prefer sweet potato chips to regular potato chips? And with the BBQ seasoning? And a beer? Yeah. That’s weekend heaven. you and your chips in sandwiches, someday I’ll try this thing you rave about. But homemade chips?! Yes please. Just made them and they were delish. In fact everything I’ve made from you is fantastic. Thanks for making me look like a better chef than I am! You’re a genius, has anyone told you that recently? Huge hit with my family. Thanks for sharing. Your pictures are beautiful! These chips really do look so perfect :) I love making my own chips! Omg!! this looks amazing!! Im so in love whit ur blog!! hugs from Mexico!!! Man, you are funny :D Your writings put a big smile on my face. Congrats on the neat blog, great recipes! Hiya. I discovered your blog post the employment of ask. This is the nicely written post. I’ll be sure to search for the idea along with revisit examine additional of your respective useful information. Wanted post. I’m going to definitely gain. Pingback: Inspiration to fuel your creativity, live simply, grow closer to God, and enjoy life! hey – this looks really really delicious and I would love to try it. However, I have not forgotten my battle with two large sweet potatoes when I made sweet potato fries. How are you able to cut them so cleanly?? They’re like rocks! yummy, I love sweet potato and these look so good! I’ll take a bag of these please! So good!